What’s the most important way to measure antenna signal? It’s hard enough to pick the right antenna with all those choices. I mean, there are different sizes, shapes, materials… if you look at the antenna selection at Solid Signal, it’s a truly bewildering group. That’s one of the reasons we have a free antenna selection service where our experts will review the facts about your location and select an antenna that should work for you. Once you get one home, it can be a little confusing knowing how you should measure whether or not the thing actually works. Obviously the one thing that matters most is whether or not the channel comes in. All the numbers in the world don’t mean anything if you can’t actually watch TV, but sometimes those numbers will tell you if you “should” be able to watch TV. There are three methods of measuring that may be available to you, and one really ends up being most important, assuming that the other two aren’t totally out of whack. This is actually a “constellation” for cable TV not antenna. Don’t get picky on me, folks. Modulation error rate, to put it as simply as possible, measures how clean that diagram is and how many bits show up outside those clean little circles. It can be an indication of problems somewhere in the receiving process, but it’s hard to pin a bad MER to a specific part. That’s why it’s not super-helpful for your average DIY’er. That, and most meters don’t measure it. Believe it or not, raw signal strength is not the most important number to use when measuring a digital signal. Digital signals are designed so that you either have enough information to get a signal or you don’t. Once you have enough signal to get a picture, having more signal isn’t going to help you get a better picture. Signal is usually measured in dBm, which is signal power compared to one milliwatt. It’s often a negative number, meaning that the received signal is less than one milliwatt. Antenna signals can be incredibly weak and still work. It’s really surprising. They’re occasionally measured in dBµV, which is signal power compared to one microvolt. With regular 75-ohm cables there’s a simple translation — subtract 108 from the dBµV value to get the dBm value. You can use whichever works more consistently for you, depending on what your meter or web site of choice uses. If your signal is reading less than -70dBm (38dBµV) you probably aren’t seeing a picture. Truth is, your signal can be stronger than that and you could still not be seeing a picture. That’s because signal strength isn’t the be-all and end-all of measurement the way you think it would be. 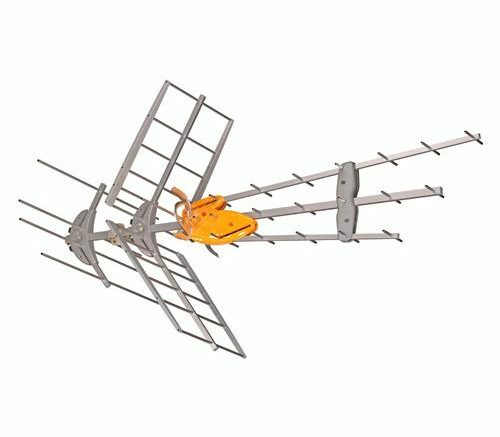 If you really want to get a good idea of how healthy your antenna TV signal is, SNR is the key. It tells you how strong the actual signal is compared to the actual noise that surrounds it. There’s radio frequency noise everywhere — the planet itself makes it, the sun makes it, lightning makes it, seriously it’s amazing any of this stuff works at all. However, as long as the signal itself is stronger than the noise around it, you’re going to be able to watch TV. You want the signal to be 20-30dB better than the noise in order to know it’s going to work. The fact that SNR is the most important measure of signal explains why amplified antennas don’t give the same benefit that they used to with analog signals. Generally an amplifier will actually reduce the SNR number slightly owing to the slight amount of noise that the electronics introduce. However, a properly designed amplifier will overcome this and the real purpose of an amplifier with digital signals is to help overcome the loss that happens as you put the signal over a long stretch of cable. In many cases, an amplifier isn’t going to help you get distant stations unless you’re in a specific fringe area. That’s why a passively amplified antenna like the ones from Televes are best — you use the amplifier if you need it, not if you don’t… but it’s always there if you change your mind. Get the real story: How does a splitter work? Do you need a parabolic antenna?